Vivian Caldwell has written and illustrated four children’s books about twins. She works with felt characters and draws on her own experience raising twins and a singleton. 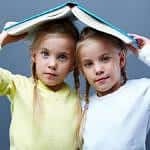 Why did you decide to write books about twins? Do all your books focus on expecting a new baby or babies? What’s your best advice to parents with twins?